Injuries limited the right-hander to 5 1/3 innings the next three seasons. He was making his third start of the year after beginning the season with 24 relief appearances. Smith retired nine straight after Goodrum’s single before walks to Nicholas Castellanos and Jeimer Candelario with one out in the seventh ended his night. He left to a standing ovation. Tigers manager Ron Gardenhire was equally impressed. Tim Hill replaced Smith in the seventh and gave up a three-run homer to Victor Martinez, the only batter he faced, as Detroit pulled to 5-3. It was Martinez’s first home run since May 19. 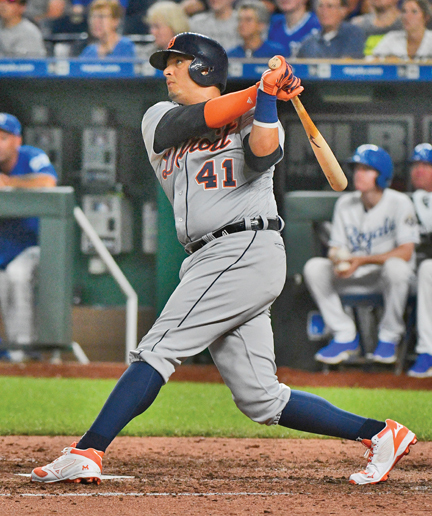 Kevin McCarthy retired all five batters he faced, and Wily Peralta gave up Castellanos’ triple and a run-scoring grounder to Candelario in the ninth before finishing for his fifth save. Whit Merrifield doubled to open the first and scored on Moustakas’ 20th homer, into the Royals’ bullpen, off Jordan Zimmermann (4-2).